Summary: You wanted answers, and you got ’em. September gets the spotlight, as does pretty much a full hour of exposition in this heady, slow, but still fulfilling penultimate week of Fringe. Walter realizes that the memories Michael showed him were buried in his subconscious, so he enters the deprivation tank to recover those memories. He remembers an apartment where September/Donald was in under the Williamsburg Bridge. Meanwhile, Windmark, now aware of the child Observer, travels to 2606 to speak with a commander. Windmark informs him that Anomaly XB-6783746 is hiding in 2036, and if the time was taken to hide him, then he must be important. He also notes that he’s starting to feel consumed by utterly destroying all of the humans…something they’ve never felt before. 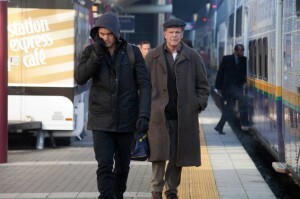 The team goes to New York, and Walter reveals that Michael gave him memories of the other timeline, allowing him to “love Peter even more” and understand everything they’ve been through. Walter, Peter and Olivia find September in the apartment, who explains the history of the Observers. In 2167, scientists discovered how to rewire emotional parts of the brain, like anger and jealousy, to enhance intelligence. However, they lost sight of which emotions were important, and as time went on, they began to delete the good emotions as well. However, September learned through his experiences with the Fringe team how powerful love could be. He eventually had his own progeny, an anomaly who was essentially a hybrid of human and observer, able to process empathic emotion and heightened intelligence more than anyone. September’s plan was to use the items the team collected to send the boy to 2167 to show the scientists the mistake they were about to make, so they could instead use the power of emotion to help become a better human being. Thus, the Observers as they are would be have never existed. Windmark and the commander enter the apartment after they leave. Windmark discovers a music player music, and the commander starts tapping his foot to it. They leave just as an anti-matter bomb takes it all out. September and Walter go to the warehouse to get the rest of his tech. Walter reveals that another memory Michael gave him is that he would have to sacrifice Peter when time is reset, though he is completely willing to sacrifice himself instead. After giving them the tech, September says he has to separate from the group and will meet up. However, the team realize checkpoints are being set up all around them. They split up and manage to make it to the monorail, but Michael suddenly steps outside and hands himself over to the Loyalists, who in turn gives him to Windmark. We’re all probably aware of the major problem big serialized genre shows pose about answers, one which Lost‘s finale brought to the forefront—how much time should be spent answering the nagging questions at the expense of telling a story? Or is answering those questions what the story should be all together? Here’s where there’s probably going to be wide dissent among critics and fans: from a TV critic point of view, this episode is rather meandering and bland in terms of general TV structure. Aside from a couple of shining points, there’s not much substance, and it seems to forcibly move pieces to set up the finale rather than organically let the plot move along. From a fan point of view, though? This stuff is awesome. The answers make a certain amount of sense, they’ve been set-up well, and there’s even a bit of surprise in there by having Michael be September’s son. There’s ties back to the past few years (the White Tulip!) and very little is left out in the open. It feels weirdly good having things we’ve been wanting to hear for years finally spelled out for us. But the problem is exactly that—it’s all spelled out for us in one sitting. I generally try to keep my own reviews from the perspective of how a given episode functions in the grand scheme of TV, and that’s what makes this hard. Through that lens, this episode is not just lackluster, but kind of a lazy attempt at writing for the most part. From a more mythology-based fan perspective, though, I can’t really fault it too much. The writing team tried to cram as much left-out information into this hour as possible, so we could feel fulfilled without having the search for some of these answers infringe upon the last two episodes of the season. It’s not a smart decision for a TV show, and doesn’t make writer Paul Holahan or director Graham Roland—both veterans of the show—look good, or really give anyone much to do. But the thing is, Fringe has proved over and over again that it can be creative with its storytelling, sometimes in spite of giving answers, even when its fans are complaining. That’s pretty much been the entire concept of season 5 thus far. 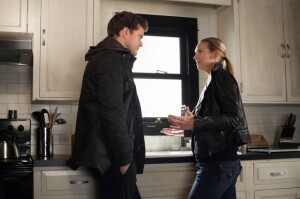 So, while I’m probably being way too apologetic, I kind of respect the show saying, “Look, we’re going to take it easy and just tell you what you’ve wanted to know since day one, that way it’s all cleared out for the finale.” I’d have to give the episode low marks for being lazy about it, but Fringe has been a strange, oft-times experimental journey itself, so it’s only fitting that it’d address that pesky genre question of “how much is left a mystery?” so directly. Part of the reason we can be apologetic is because these answers don’t shake up the foundation of the show too much. The reveal that the plan is to reset time is a somewhat foregone conclusion at this point, but it’s good to definitively hear it. And in true Fringe fashion, it’s nothing simple; we’re going to fix the present by travelling to the future to change the past. Anyone who isn’t up on time travel stories will surely have some headaches after thinking about that. While I’m surprised only Walter and September connected the dots about Peter not existing over here in an Observer-less timeline (haven’t we been down this road?) it provides a good emotional dilemma for the final hours. The major issue, however, is that we’ve seen this conflict before; season 3 was all about Peter sacrificing himself to save the world. With the revelation/retcon that September’s appeal that “the boy is important” is not Peter, it’s entirely possible that all the stuff with Peter and the machine in season 3 was training for what’s to come, in a way. How the Observers came into being is a mildly interesting story, one that’s certainly been done to varying degrees. But Fringe is at its best when it takes stereotypical sci-fi concepts, expands upon them, and creates an emotional story to drive them. 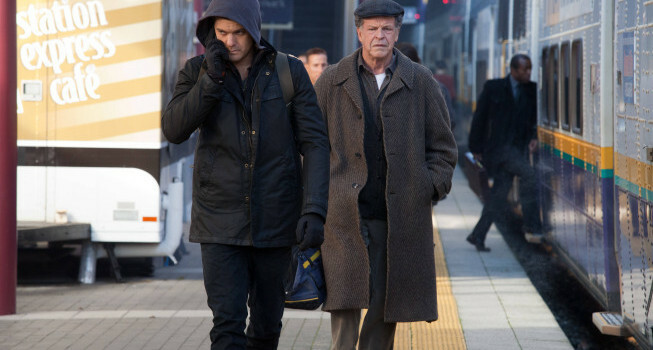 The history of the Observers isn’t on the level of Walter starting a war of parallel universes, but it does have emotional resonance with the revelation of Michael being September’s son, which in turn parallels Walter and Peter’s story. It still ties it back to the show’s original concept of science going too far, so like multiple instances this season, we’re seeing numerous thematic ties to earlier points in the show. In an hour with seemingly endless exposition, it’s no surprise that the shining moments were the big emotional ones. Walter’s chipper attitude from reliving his season 1-3 life with Peter was great fun. The sheer fact that Walter finally has memories of the original timeline is another reason why this episode seems to be made for the sheer purpose of appeasing the nitpicky fans (because boy howdy have people complained about the alternate timeline.) Peter and Walter’s conversation before meeting September is the strongest point in the episode, probably the best father-son scene we’ve had in a long while. Of course, like all sweet moments, it precludes the darker scene where Walter realizes he has to lose him again—another strong scene that gives the actors good stuff. Michael Cerveris got some fantastic moments, too; he managed to keep the same speech patterns and head movements as September, while still softening them for his newly emotional state. It’s actually sad that September was emotionless and monotone for so long, because Cerveris is insanely good at making an instant connection with his eyes. Anna Torv had some amazing silent reactions during September’s exposition (which are arguably some of the hardest things to do in acting.) But it’s weird just how little she had to do this week. It looks like Olivia will be given more material next week, but I can understand the complaints Torv fans have been voicing thus far. Olivia has definitely been put on the back burner lately, and it’s disheartening to see this late in the game. The final portion of the episode was a mixed bag. The tense, drawn-out escape section was extremely well-handled, much more interesting than the generic shoot-outs we’d been getting from week-to-week. However, for an ending setting up the finale of this huge story, the cliffhanger was…anticlimactic, to say the least. It’s hard to tell if Michael stepping out of the monorail was supposed to be shocking, or scary, or if we’re just supposed to think Michael’s an idiot. Sure, Olivia was scared and frustrated, but are we supposed to suspect Michael has a plan of his own, or was it meant to just be a mistake? There’s a new little mystery, I guess, but it plays off more like incompetence than suspense. The bland score for that part didn’t seem like it knew how to react, either. The whole scene didn’t feel like “Oh crap!” so much as “Well gosh, that’s no good.” It doesn’t build momentum for the finale at all, and if it weren’t for the awesome commercial for next week, it would have killed a lot of my own excitement. On one hand, “The Boy Must Live” is a lackluster installment, and not a particularly good lead-up to the finale. But it does give fans a wealth of references and answers, and does set-up the prominent mythology of the finale, even if the momentum isn’t quite there. Most of the questions we have are ones that can be answered in the finale, which can now be mostly exposition-free. Still, I wish we could have found away to get the answers and still tell an interesting story. Fringe has been a frustrating-yet-amazing journey to be on, and it deserves to have a send-off that encapsulates the fun, twisted, emotional and heady adventure that it is. It might seem random that Windmark and other Observers are only just now tapping into their emotional centers, but it definitely works thematically. And Windmark admitting to feeling rage/hatred for the first time justifies his weird “animals” comment last time. The effects during the “Observer birth” flashforwards aren’t great, but they work well enough and aren’t cheesy when they easily could have been. And the 27th century looked really cool, from the little we saw of it. So good on that. Hey! One more naked Walter joke for the ages. It was a good one this time, too.